Execution appeared in Saturday's Mirror and Express. 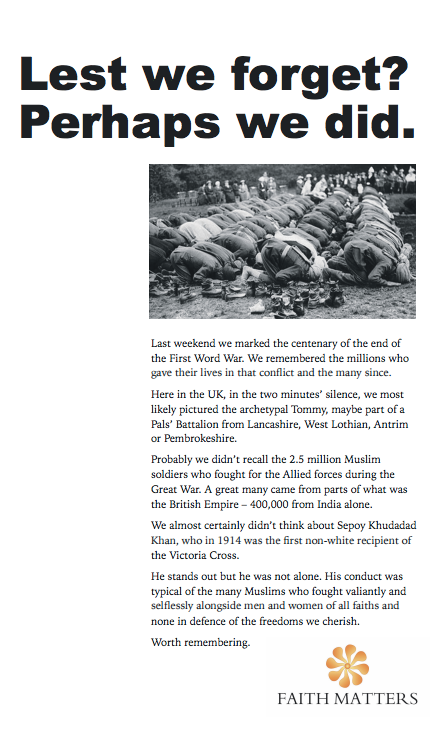 Faith Matters, a non-profit group promoting religious tolerance, has launched a newspaper ad celebrating Muslim soldiers' contribution in the First World War. The campaign, which launched in the Saturday editions of the Daily Mirror and Daily Express on 17 November, says people were unlikely to know that 2.5 million Muslim soldiers fought for Allied forces during the Great War. Many Muslim soldiers came from parts of what was the British Empire – 400,000 from India alone, one of the ads states. The campaign comes from an initiative by David Emin, the former ad director at the Mirror newspapers and partner of creative agency Beaumont, Emin & Reedy. His partners, Phil Reedy and Matt Beaumont, created the work. Emin said: "There is too often a negative perception of the contribution the Muslim community has made to our society. Certainly, most people are unaware of how much we owe to so many Muslims that fought for the country in all the wars of the last century. "We came up with a simple message that expresses this and timed it to run in the afterglow of last weekend’s ceremonies of remembrance. We felt that the Daily Express and the Daily Mirror were the two best media brands to convey this message and we were very pleased when their editor-in-chief, Lloyd Embley, agreed to run the ads." The campaign follows a Faith Matters anti-Semitism campaign (below) that ran in May with the headline: "We Muslims have one word for Jews. Shalom [the Hebrew word for peace, hello and goodbye]." Why have just one marketing guru when you can follow them all?